Gary Teale was relieved that his St Mirren players "dug out" a narrow win away to Partick Thistle but acknowledged that it will take more to keep the Buddies out of the relegation zone. Loan signing James Dayton's strike in the sixth minute gave St Mirren the three points at Firhill as they held firm to secure their first clean sheet since last May. The hard-fought 1-0 win lifted them above Motherwell into 10th spot in the Scottish Premiership, though the Steelmen have two games in hand. "Whether it was a master stroke or a bit of luck, we'll certainly take it," said the manager of his decision to give Dayton his debut. "I said to James yesterday after I'd signed him that I was looking for him to make an impact. "He's scored the winner for us so he couldn't make a bigger impact than that. "I've been praising the boys for their performances over the weeks because I thought we've been excellent in terms of being on the front foot. "Tonight I felt was the worst we've played for six or seven weeks but the defending was outstanding. I said we wanted to be more resolute. "I hope it's not another 31 games until our next clean sheet." Thistle had 60% of the possession and five attempts on target to St Mirren's two but rarely threatened an equaliser as Jim Goodwin and Marc McAusland mopped up in the heart of the Buddies defence. Teale, who this week learned he would until the summer at least, continued: "You want to be creating chances and exciting to watch, but sometimes, certainly in the position we're in, you just need to go and dig out a result and I thought we dug out a result tonight. "Thistle had a lot of the ball. They are an excellent side but they did not really work Mark Ridgers. "We scored early and it gave us something to hold on to. "It's a collective spirit we've got here. We're out the bottom two just now and we need to make sure we stay there. "Jim and Marc were outstanding, especially the way they were dealing with the balls down the middle. "It takes a lot of communication and work rate among the back four. I'm over the moon for the players. It's very satisfying when you grind out a result. "It's a big win but there's a long way to go. We need consistency. Hard work is going to take us away from the position we're in." 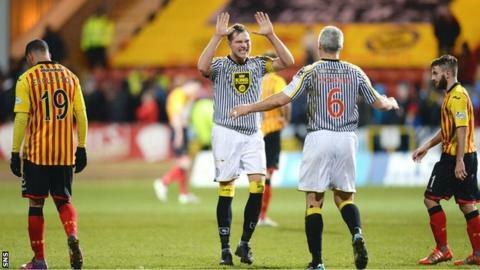 Partick Thistle manager Alan Archibald described his team's performance as "very poor". He said: "The way we started the game set the tone. We found it very hard to break them down. We had a few half chances. We didn't work their keeper hard enough. "We've got to do more, especially being the home side. "You've got to play to the conditions and the pitch didn't make for playing neat passes in the middle of the pitch. Sometimes you've got to get it wider quicker. "When you start badly it is hard to get out of that. "We've got to bounce back. We've got a cup tie next week (against Inverness in the Scottish Cup)."